Once you’ve acquired a Bitcoin or two to begin your cryptocurrency experience, you’ll probably acquire a new daily ritual along with them: checking the most current Bitcoin price charts. Investors who trade on the standard fiat currency markets utilize price charts to compare competing currencies and their current exchange rate. These charts display vital information about one currency’s relationship to another, and each currency’s relative value. For example, by consulting the XE.com currency chart for the British pound, we learn that on the night of June 22 – one day before Britain’s “Brexit” referendum on leaving the European Union – the British pound was valued at $1.50 in U.S. dollars. But the following morning, on the news that British voters had narrowly approved Brexit, the pound’s value crashed to a low of $1.32 – signaling extreme unrest in the worldwide currency markets. Movement like that experienced by the British pound is practically unheard of for standard fiat currencies, but as Bitcoin users know quite well, cryptocurrency is a different story altogether. The exchange rate between U.S. dollars (USD) and Bitcoin (BTC) stood at $638.02 to 1 BTC at the time this page was written. But in that same week, the price of a Bitcoin fluctuated between $614.11 on October 9 and $638.86 on October 12. That’s a shift of $24.75, or 3.88 percent, in just 72 hours – numbers that would give a standard currency broker heartburn. Learning how to analyze data like this, and arriving at your own conclusions about the market, is an essential skill for anyone hoping to use Bitcoin as an investment or speculation vehicle. And even if your primary motivation for owning Bitcoin is simply to make certain online purchases a little easier, knowing exactly how much money you really have at your disposal is a breeze when you know your way around a basic price chart. Below you’ll find a primer on understanding Bitcoin price charts written with the beginner in mind. What is the Most Basic Bitcoin Price Chart? For the most part, when you search for Bitcoin price charts the likely destination will be a line pricing chart. The terminology can sound a bit complex, but this chart is the most basic form used in elementary classrooms throughout the country. A Bitcoin line pricing chart is designed to track the value of 1 BTC in relation to one standard currency or another (usually USD), over a certain period of time. Line pricing charts can be set to show several different windows of time, including the last 12 hours, 24 hours, one week, one month, one year, two years, five years, and 10 years. When you review a basic Bitcoin line pricing chart, you’ll see the familiar X-axis and Y-axis design, with a horizontal line on the bottom of the chart representing the X-axis, and a vertical line on the left hand side representing the Y-axis. The X-axis will be labeled with various dates within the selected timeframe, while the Y-axis is labeled with something like “Market Price (USD)” to signify the current value of a single Bitcoin. The actual graph itself is created by plotting points along both axes to represent the value of one Bitcoin at any particular date. A line connecting every point plotted on the graph provides a visual representation of the movement in Bitcoin value over any particular duration. The introduction to this page provides an example of this process in action. Using the information above, a line pricing chart showing three days’ worth of data that began on October 9 of this year would start with the first plotted point at $614.11. From there, subsequent points would climb higher on the Y-axis, and further out on the X-axis, to show how that price escalated over the next 72 hours, culminating with the final plotted point at $638.86. Line pricing charts are perfect for analyzing Bitcoin value, because by simply providing that three-day window and the starting / end price points, we’re really not telling the whole story. For example, we can sort that same line pricing chart to display hourly intervals – essentially adding 24 different points to the graph to represent the closing price on the hour, every hour. By doing so, we’d notice a sharp vertical climb sticking out like a sore thumb, one in which the price of a Bitcoin spiked from $618.36 to $632.18 – in just one hour. Identifying massive movements like that is the first step. From there, you can investigate external factors which may have precipitated the price increase, and use this knowledge to better predict market behavior in the future. Every major Bitcoin wallet provider or exchange platform offers basic line pricing charts at the very least, with most offering highly customizable features, so studying this analytical tool should be considered a mandatory aspect of your Bitcoin tutelage. Are There Other Charts I Can Use? 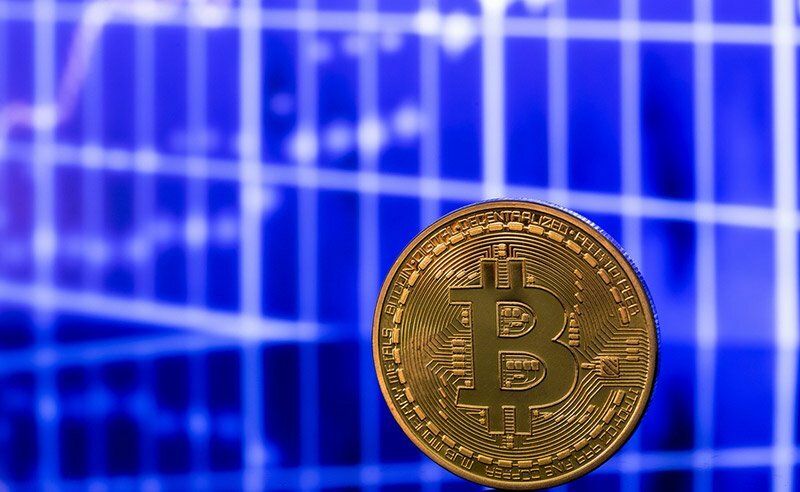 While the line pricing chart is perfect for reading value trends over time, which is what most Bitcoin users tend to do, other charts are better suited for the high-frequency, high-volume trading that defines the cryptocurrency speculation market. The extreme level of volatility in Bitcoin’s value relative to the dollar is no accident, and heavy movement in price typically suggests major trading transactions taking place. Bitcoin investors are constantly scouring the market for chances to derive value from their assets – either by selling off existing reserves when prices rise to turn a profit, or by purchasing new reserves when prices drop. We mentioned that the price of one Bitcoin has been known to rise and fall by several percentage points in just a single hour, so savvy traders are always looking to stay ahead of the curve. Various advanced charting systems are used to provide in-depth data on Bitcoin value volatility, including the candlestick chart, which shows the opening and closing price, along with the high and low price, for any given day. Candlestick charts are similar to bar graphs, with a colored bar signifying the relationship between opening and closing price. Another advanced chart to look into as your Bitcoin knowledge grows is known as a column volume chart. Whereas line pricing charts are designed to reflect the price of trading Bitcoin, column volume charts depict how many Bitcoins are being traded during a given period. This chart format is most suitable for studying the frequency of trade activity during particular date ranges. Finally, especially talented Bitcoin thinkers enjoy combining line pricing charts, candlestick charts, and column volume charts in one visual to simultaneously track multiple data trends.